Talking Points to Get RMV Bill Passed! The RMV collateral sanctions bill is now in Conference Committee to hash out the details between the House and Senate versions. We support the Senate version. 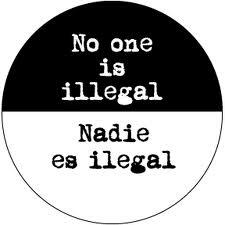 Let's make sure our representatives know that! PLEASE CALL, WRITE LETTERS TO AND ARRANGE MEETINGS WITH YOUR LEGISLATORS: Ask them to support the Senate Version of the Bill to Repeal the Driver’s License Suspension Law (Senate 2021)! Yesterday (1/6/16), the House voted unanimously to pass our bill to End Collateral Sanctions at the RMV, but there is still work to be done. CALL YOUR STATE REPRESENTATIVES & ASK THEM TO PASS H3039! On September 24, 2015, the Massachusetts Senate voted unanimously to pass our bill, An Act Relative to Motor Vehicle Suspension, now known as S2021. 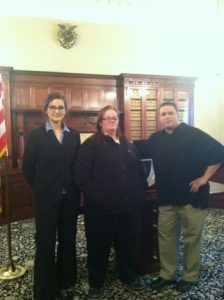 Now, the Massachusetts House must act to pass it's sister, H3039. 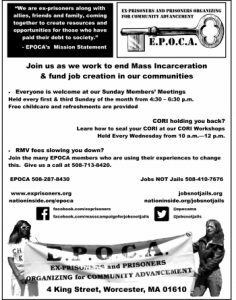 The vote will be tomorrow, January 6th at 1 p.m.
June 27th "Jobs Not Jails" Direct Action Training! Learn more about the actions being taken for the Summer of Solidarity. Does your legislator support the Justice Reinvestment Act? 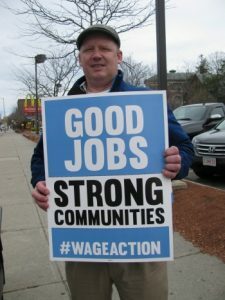 The Justice Reinvestment Act (S.64/H.1429) will be heard by the Massachusetts Legislature on October 14th and we want your legislators to know how important it is to you to end mass incarceration and change our criminal justice system by re-investing in our communities through job and educational opportunity. The Justice Reinvestment Act will only get passed with your help! Guest Speaker: Norah Dooley, Storyteller & Author Norah will lead a Storytelling Training to enhance our one-to-one intentional conversations. April 14th will be a busy day - we hope to see you at one or all of these events! This month we have an exciting series of events occurring across the state. Come learn about the bills related to mass incarceration and prison reform that we hope will become law in the next two years and how you can help make our criminal justice system more fair and effective. Massachusetts State Senators are holding listening sessions across the state to hear from constituents and bring "Beacon Hill to you". Come to the Youth Jobs Coalition and Jobs Not Jails for the Youth Jobs Rally on Thursday, February 19 at 11:00am! Freedom House 5 Crawford Street Dorchester, MA 02121 2-4 p.m.
We'll be closed from Monday, December 22nd until we re-open on Monday, January 5th. 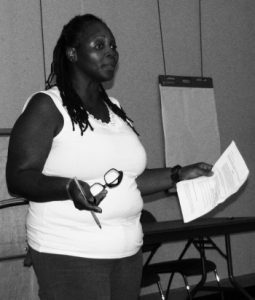 Next Jobs NOT Jails Statewide Meeting: Saturday, December 6th 10 a.m. - 12 p.m. Celebrate 10 years of working to end Mass Incarceration while building leaders in our communities! URGENT - Calling All Members, Friends and Family! Call Us with Your Parole Board Experiences! 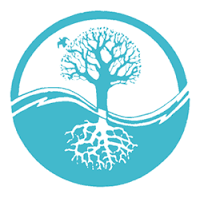 Come and Learn a Great Tool for Community Organizing! 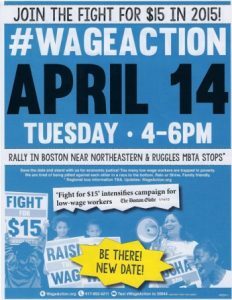 In Solidarity: Low Wage Worker Day of Action #wageaction Thursday June 12 4-6 p.m.
Our RMV Bill is on the Move! Find a Coalition Meeting Near You! There are many ways you can help build the movement! Lots to do this coming March! Find out where the new candidates for Governor of Massachusetts stand on criminal justice policy issues - and show them how important this is to us! 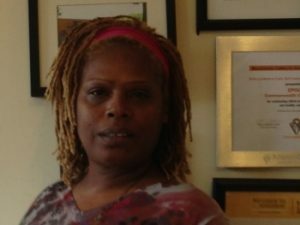 Meet Marinella, Our New Community Organizer Apprentice! 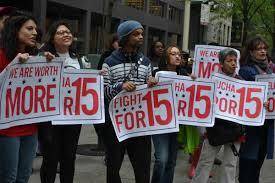 Interview with Marinella Blake 1/13/14: Why is Jobs NOT Jails Important to me? 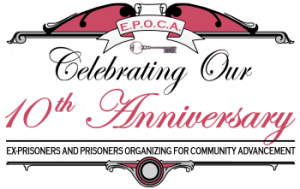 Interview with Lillie Williams , 2 months in to her EPOCA Emma Tenayuca Community Organizer Apprenticeship funded by Boston Women’s Fund. Come and join the conversation and join the movement to end Mass Incarceration!! Governor Patrick is going to be addressing issues related to mass incarceration and public opinion: Next Thursday, February 20, from 10:00 to 11:30 a.m. at UMass Boston’s Campus Center. This will be a tightly controlled event, with little or no opportunity for public comment - but we need to demonstrate that when our political leaders address issues of Mass Incarceration, PEOPLE SHOW UP! Please see below for further information. We are so happy to be able to expand our organization to include Cassandra on our staff! 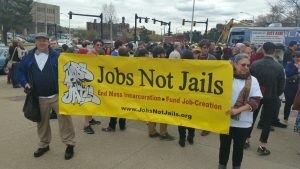 The Jobs NOT Jails Campaign Website is Here!